LeBron's rocks Kobes in first photo with Lakers uniform. 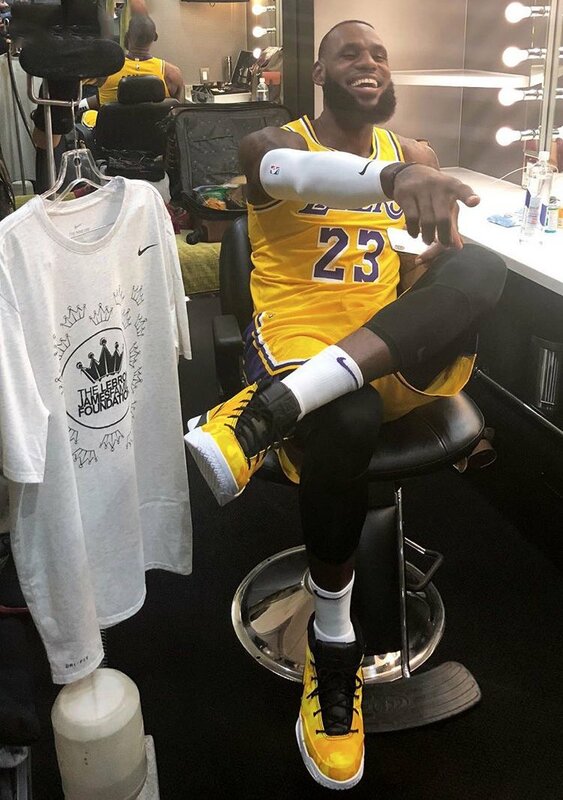 By now we've all seen composite images of LeBron James in a Los Angeles Lakers uniform, but last night the four-time NBA MVP finally put on the Lakers' gold and purple #23 jersey for real at an NBA 2K19 photo shoot. In addition to the Lakers gear, LeBron also showcased an unreleased, L.A. inspired version of the UNDFTD x Nike Kobe 1 Protro which caused more of a commotion than the Lakers jersey itself. Similar to the special edition PEs worn by the likes of DeMar DeRozan, Isaiah Thomas, Devin Booker and Giannis Antetokounmpo, 'Bron's Kobe 1 Protro features a gold camo print on the upper along with purple UNDFTD branding. While it's unclear if LeBron's Lakers-themed Kobe 1 Protro will ever release, sneakerheads can expect to see plenty of purple and gold colorways of LeBron's signature sneaker line this season, including the upcoming Nike LeBron 16 silhouette. That sneaker has not yet been unveiled, but sample images have already surfaced - if you're interested in checking them out click here. Check out photos from 'Bron's IG story in the posts embedded below. Sports Sneakers News Lifestyle LeBron James lakers nike kobe bryant Kobe 1 "Protro"